After some cold but beautifully sunny and crisp weather, Winter seems to be giving us one last bite before Spring arrives. Only a week ago our third guests since we re-opened enjoyed Spring-like conditions, the daffodils that line our drive were in bud and the birds were treating us to the sort of dawn chorus that presages their nesting and then ......the so called 'Beast from the East' arrived! As usual though, the snow hasn't been falling unrelentingly and even between showers we have enjoyed some beautiful light effects on the sea with the sun breaking through the clouds - and bringing life to the icicles hanging from the roof of our porch. 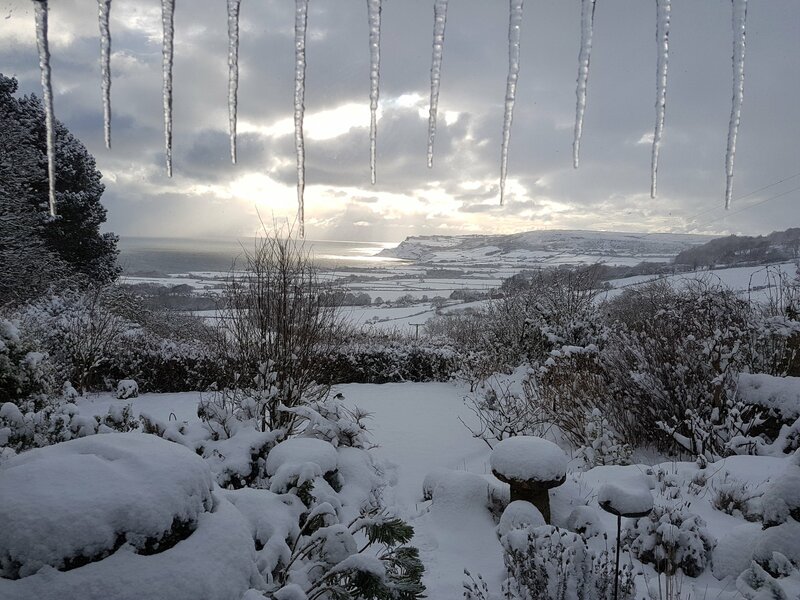 The garden, where in a month or so our guests will enjoy the view whilst having a welcoming drink and homemade cake, is clothed in snow and the trees and shrubs are covered in a white blossom of snow. We really are lucky to live where we can enjoy such beauty whatever the time of year or weather. If you are 'snowed in' at home right now there is no better time to start thinking about treating yourself (or your loved ones) to a break this spring or summer, so why not check our availability calendars and book yourself a few nights bed and breakfast with us at Skerry Hall Farm. We have vacancies over the Easter holiday period and you can be assured of a warm welcome. Or how about giving one of our gift vouchers, available for any amount towards a stay with us? Just email or phone and we'll tell you all about them - an ideal birthday or anniversary present, or just a special surprise. Remember that whatever the time of year there is always plenty to see and do in and around Robin Hood's Bay.